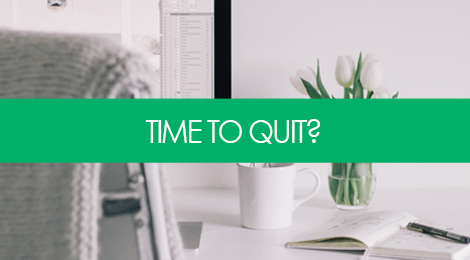 A close friend recently expressed her confusion around whether or not the time has come to quit her job. She has a very steady job as a designer for a tech startup in New York. But lately, she’s been feeling a bit stagnated, in part to her own work, but also due to the structure of the organization and the difficulty in getting management to sign off on decisions to move projects forward. The organization offers great benefits from a cultural perspective – great reputation, high visibility projects, pretty good work-life balance for a startup, and excellent financial benefits and compensation. The downside? She doesn’t feel like she’s achieving much personal growth these days, and wonders if it might be time to look elsewhere. She feels stalled in her own work, not to mention held back by bottlenecks caused by other members on her team and within the organization – things she doesn’t necessarily have control over. There are two obvious ways we can look at this situation. The first – it’s a stable, well-paying job with excellent benefits. What is the harm is staying around another year or so, and then re-entertaining the idea of a move? There’s simply too much going on right now for her to wrap her head around leaving. The second – the longer she hangs in there, and the more she stalls her own professional development and progress, the less she may have to show for it and answer to in an interview. So what’s the best option? At no point in your career is it premature to be thinking about the next step – even if you started a new job yesterday. Similar to how one is advised to think about selling a company from day 1 – you should be thinking about where you’re ultimately focused on going in your career. And when you start to see yourself stalling or veering off the path leading towards that goal, that’s when it’s time to start really reevaluating the situation and weighing your options. It’s not uncommon for projects to get stalled, and perhaps the situation will change in coming months. I advised my friend to work backwards and set a timeline for herself, and put a target date in place where – if things have yet to progress – then it’s time to start looking elsewhere. We agreed that for her, it made sense to look 6 months out, as things often change from quarter to quarter in her organization. Other organizations may move more quickly or slowly, so gauge your estimate based on the individual working culture of your company. The second part of that is understanding what kind of change she needs to see in order to feel confident that she will have the resources and the room to progress and grow in her role moving forward. Is the same situation likely to arise another 6 or 9 months from now, or is this just a particularly tricky time of year where projects are bottlenecked and/or progress is slowed? You also want to consider what is and what is not within your control. One of the challenges my friend was facing was that a good amount of her dissatisfaction was attributed to factors over which she had no control, i.e. other people’s work. That’s something that may or may not change, and would be difficult for her to forecast. On the other hand, if her lack of enthusiasm was due largely in part to not feeling challenged, that is a situation that could potentially be addressed by speaking to her manager and taking on more responsibility. Leaving a job or an organization can often be a tough call to make, and sometimes an uncomfortable. But you have to look both inward and outward to gather the necessary information to make that call. Look outward at the organization – are things likely to change, and what is the potential for you to continue growing 6 to 12 months from now? And then look inward – what kind of growth do you need to see in order to feel that you’re remaining on track toward reaching your goal? Finally, think about it this way: when approached in an interview, how will you be able to describe the last 6-12 months of your position in terms of what you’ve contributed, what you’ve learned, and how you’ve grown? Tags: career, hr, interviewing, job search. Bookmark the permalink. Love that you pointed out that “At no point in your career is it premature to be thinking about the next step – even if you started a new job yesterday.” A lot of people feel like it is disloyal but there’s nothing wrong with strategically planning ahead. Copyright © 2015 Brooklyn Resume Studio, New York.